Food Service Staff are on the front line and are the face of the program. It is important that they recognize the purpose, value, and impact of their work. Food Service Staff who take pride in their work will "sell" the program through their commitment and enthusiasm. 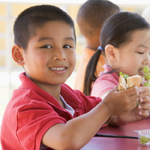 The Child Nutrition Act preamble states that it is the programs responsibility, "... to safeguard the health and well-being of the Nation's children..." Help employees see how important they are to the success of students' futures. Use SNA awards and events to recognize staff. Encourage, or expect, all staff to become food safety certified. Consider partnering with a neighboring district to offer more training opportunities. Remove the work "just" from staff vocabulary. They are professionals; they are not "just a cafeteria worker." The resources below provide practical information for easily implementing activities and sharing information that assist with staff development. There is a great deal of no cost material already developed which can be printed and put to use immediately. The Institute of Child Nutrition (ICN), formerly the National Food Service Management Institute (NFSMI) and part of the School of Applied Science at The University of Mississippi, is the only federally funded national center dedicated to applied research, education and training, and technical assistance for child nutrition programs. The Institute's mission is to provide information and services that promote the continuous improvement of child nutrition programs. ICN offers face-to-face and on-site training seminars at little or no cost and free online courses designed to support the professional development of child nutrition program and child care personnel at all levels of responsibility. The Institute also delivers free training resources managers can use to train their staff. Visit their Web site at Institute of Child Nutrition. View the USDA page for Foodservice Professionals. See the School Meals That Rock (blog).